You can secure your limited National Heritage Pre-decimal Penny today for just €9.95 (FREE Postage) – a fantastic €30.00 saving on the regular price! The remaining coins, each accented in pure 24-carat Gold and accented in Rhodium Platinum will be automatically sent to you at convenient monthly intervals for just €39.95 each (plus €3.95 P&P). You can stop receiving the coins at any time. 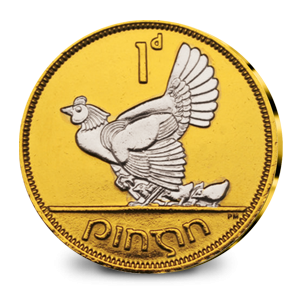 All purchases are protected by The Dublin Mint Office 14 day “no quibble” return guarantee.